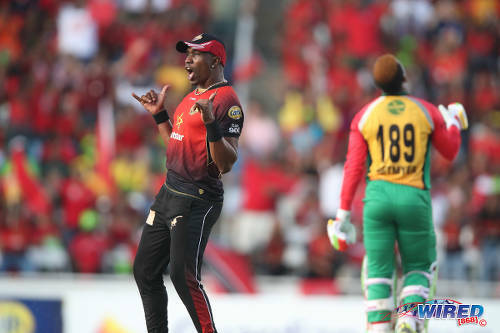 “Fast forward to the equally radical CWI-sanctioned CPL T20 league and its recalibrating of the traditional model of country representation, through a process of team ‘franchising’. 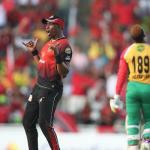 Photo: TKR captain Dwayne Bravo (left) celebrates the dismissal of GAW star batsman Shimron Hetmyer during the CPL final at the Brian Lara Academy in Tarouba on 16 September 2018. 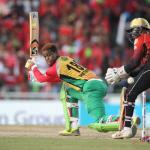 The Caribbean Premier League (CPL) has done more for popular support for the game of cricket in five years than the West Indies Cricket Board—now Cricket West Indies—in decades. It should also be helping us redefine the integration project. The fact is “West Indies Cricket”—not the game of cricket—as an expression of a coherent Caribbean ethos, has not existed in a very long time. There is no educational force-feeding or social engineering capable of reversing the process among the millennials. They’re gone. 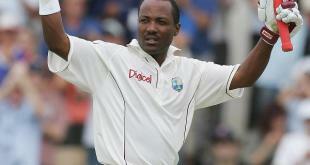 West Indies Cricket’s interface with the formal integration system, Caricom, also does not fit; and this phenomenon is very much an anachronism and growing irrelevance—especially in the context of the four member countries in which the sport has no special significance; and an entire generation in the other states, for whom it means almost nothing. The enigmatic but disgraced Allen Stanford knew very well what he was dealing with when, in 2006, he launched his 20/20 tournament and employed individual country identities as part of the astute marketing of the event. Fast forward to the equally radical CWI-sanctioned CPL T20 league and its recalibrating of the traditional model of country representation, through a process of team “franchising.” This is Stanford on steroids—national flags; but this time with juggled regional and international names attached. 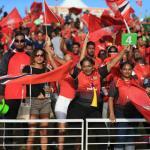 Photo: Trinbago Knight Riders supporters make a point during the CPL final against the Guyana Amazon Warriors at the Brian Lara Academy in Tarouba on 16 September 2018. The transition however remains incomplete. For instance, self-identifying as an Amazon Warriors supporter since 2013 has not been an easy thing for me, if only because I cannot understand why people are taking a commercially-branded exercise, employing one of the oldest marketing tricks in the world, as a matter of “national” interest and pride. You see, if you use a national flag in the branding of any product, you can convert support into passion, affection into love, and a simple contest into a war. 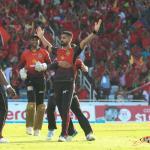 So, Trinidad and Tobago—there is no country called “Trinbago”—did NOT play Guyana in the finals of CPL 2018. When, for instance, Ali Khan uprooted Cameron Delport’s off stump with the first ball of the game, this was an American bowler taking the wicket of a South African batsman. So, should what occurred as flag-stomping at Providence—that was Jason Mohammed and Rayad Emrit’s flag, by the way—been manifested in Tarouba as “taking the knee” when Khan upset the mango cart? 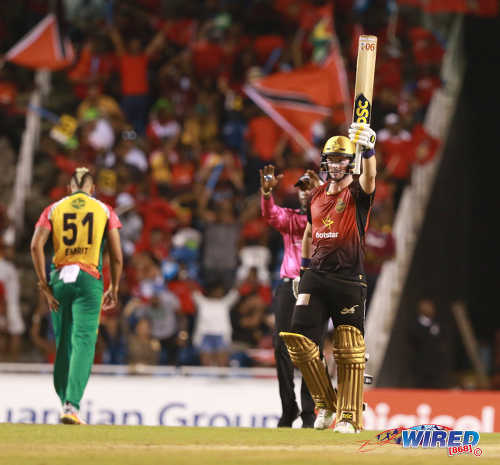 Photo: TKR batsman Colin Munro, a New Zealand international, salutes the crowd after his half century against GAW during the CPL final at the Brian Lara Academy in Tarouba on 16 September 2018. Likewise, has Chris Green had creek water and tasted labba? How does Luke Ronchi like the wild hog at Parika? If Cameron Delport hears “set gem-like and fair between mountains and sea/Your children salute you, dear land of the free”, would he know where those lines came from? Speaking of which, the Providence incident was a bit of an isolated aberration, but it all too easily segued into a particularly ill-informed online discussion on T&T abuse of Guyanese travellers and whether Guyanese oil should ever be refined in Trinidad. I should have known. 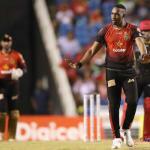 For, during the inaugural tournament in 2013, with Sunil Narine, William Perkins, Denesh Ramdin and Lendl Simmons on board for the Warriors, when I teasingly renamed the entire team the “T&T Amazon Warriors”, I invoked the vitriolic displeasure of Trini and Guyanese friends and colleagues alike. 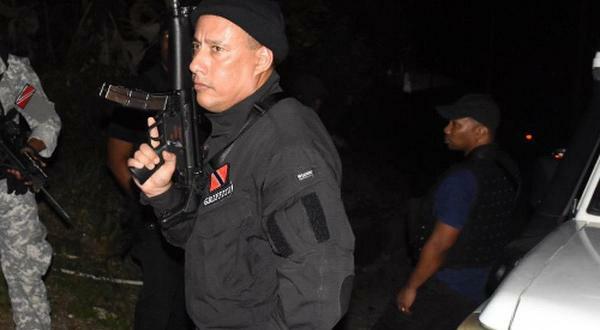 Hopefully, when prime minister Dr Keith Rowley lands at Cheddi Jagan International today, the result of Sunday’s game would resonate as clearly as his last birdie on the fourth hole during his opening gambit to retrieve diminishing affection in Guyana. The rebirthing of cricket in the Caribbean has the potential to lead the re-orientation of our cross-border relations through recognition of the changing nature of modern success. 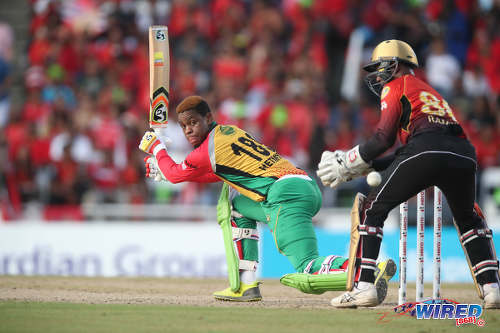 Photo: Guyana Amazon Warriors batsman Shimron Hetmyer (left) plays at a delivery while TKR wicket keeper Denesh Ramdin looks on during the CPL final at the Brian Lara Academy in Tarouba on 16 September 2018. Our integration process already allows for Emrit to take a rightful place in Georgetown and for Gayle to live and work in Basseterre. This is clearly more than cricket. What, after all, do they know of cricket who only cricket know? Oh how we crave CLR on the CPL! Media Monitor: Does moving T’dad Express editorial finger find sport nothing to write home about? Want to share your thoughts with Wired868? Email us at editor@wired868.com. Please keep your blog between 300 to 800 words and be sure to read it over first for typos and punctuation. Previous Media Monitor: Does moving T’dad Express editorial finger find sport nothing to write home about?